Deep Wadhwa is the Founder of LinkOceans. He started his career as a copywriter and soon turned into a Full-Fledged Digital Marketer. He has worked with various brands in the past and carries over 6 years of experiences being in Digital Marketing. He has helped brands with their sales and promotion. He is now cooking his own stuff at LinkOceans helping brands getting branding done in the right way possible. Apart from work, he is a lyricist, guitarist, singer and a sports freak. LinkOceans (Startup Story)- A Little Initiative Turned Into A Dream & Now Reality! QUICK SUMMARY : In this post, I’m going to tell you how we built up LinkOceans from scratch. It’s a brand now helping us to generate $5K+ per month. Go ahead and the read the entire post. I hope you get some crucial insights about our journey so far. The same I’m feeling now and so excited to share how we started LinkOceans. I have been in digital marketing for the last 6 years now and worked with various brands over the web. Back in 2017, I saw that freelancing was on boom all over the web and lots of opportunities were there to earn extra income. There were lots of groups on Facebook, where people were posting requirements about Content Writing! But, I didn’t want to do that alone. So, I had a talk with my partner – Arpita and discussed the idea with her. We both were working in the same company and I pretty much liked the way she worked. We did know each other for a time by then, so I just discussed everything with her that was in my mind. She helped me with that little initiative and we were able to grab 5-6 orders of content writing in just 10-15 days. It didn’t make us huge but we were quite happy that it worked. The good thing was it gave us the confidence that we can do this for ourselves. We wrote articles for clients that went live on sites like TheNextWeb, Huffington. Later we wrote articles about BIG authority sites Business2Community, Hackernoon, Entrepreneur, Sheknows, YourStory and many more. But I did review the copies. Anyways, in short, we made our first $50 with the content writing work which was 3-4K INR. Later, we moved to our JOB part. We were so busy in our daily 9-6 JOB that we were not able to give much of our time to that freelancing option. But something was cooking in our mind as we saw the potential of FREELANCING in the market and how much it can help to make extra income! It was mid in April when we both decided to rethink on the freelancing option again that helped us earlier to make some extra money. But when you know the potential, you can take the plunge. You should not die with the experience that you have right? Same was the story with both of us. So we dig deeper this time and explored more options. More like what other things we can do and make more money. More importantly, how we can use our experience in Freelancing and do better than others. We both were into the digital marketing for a long time, I was having 4 years at that time & Arpita 2 years. So, we started hunting again but this time not for content writing thing. 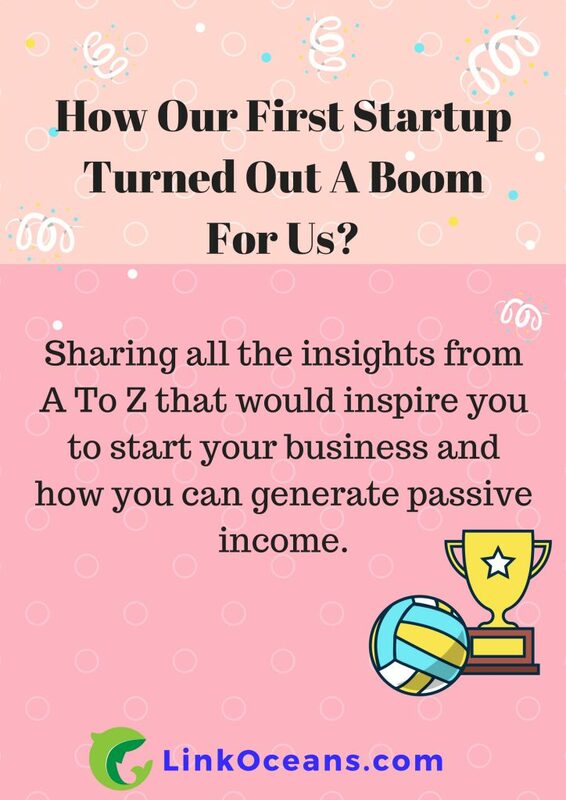 We were actually reaching out to the clients who were looking for promotions or a shoutout for their brand on authority sites like Forbes, Entrepreneur, Patch, Huffington, and others. In the early days, it was hard to find the first client. We had the idea what this new approach can bring to us, how much potential it has but we didn’t have a clear path. We were going on calls every day with certain plans, hitting up the authority sites, writing articles, submitting them and waiting for the results. Trying so many things at random but wasn’t able to draw a clear path for it. It happens you know, and it happens with every startup. Luckily we were doing something every day rather sitting and thinking of what to do. We were working like 14-15 hours a day that was the complete opposite of our job timings. Now we were having no surety of recurring income. It was like we will earn if only we work and we have to work every single day. Honestly saying, the fear of failure was always there in our minds. What we gonna do next? How would we able to generate recurring income so that we don’t face any financial issue. And after, we didn’t stop and never looked back. That one client ended our wait for 3 months.. Slowly, we started getting a recommendation for our services, people were liking our work and it went on Sharing some of the snaps of that time. -It was in August 2017, when we were going pretty well but then bluffed by a dealer and lost $650. It was just 3-4 months of our success. We worked really hard and had some of our savings. But it all went in compensating the amount for a client. End to our hopes and dreams of getting financial freedom and fulfilling our dreams.. But we both decided not to give up. We believed in each other strength, paid to the client for the loss from our pocket and moved on! It was a tough phase though, but you such things or obstacles come in your life to test you better. And we know what we did. Every business needs a shape. Right? Whether you are a freelancer or a business owner, you need a proper portfolio of your work that you can show to your clients and build some trust. After the scams, things were coming on track as we moved on! It was always in mind that we need a platform for our services but in the earlier stage, it wasn’t possible. As you have to have money to get a website done. And it was in December when we decided to make our own website for the services we were offering to our clients. We booked LinkOceans, paid for the hosting, get our template designed and decided to launch it as our own HUB. We were on track after the SCAM and doing pretty good with the business. We kept helping clients by delivering them the best service possible and in return, we kept getting recommendations. From June 2017 to January 2018, that simple objective of “Keeping clients always happy” gave us a jackpot. Yes! The word of mouth got viral and we started getting businesses from BIG GUNS. I mean really BIG. It’s like it doubled or tripled our business in no time. It generated us over $5000 which was actually the average earning of our business for the last 3-4 months. This helped us planning on further projects. Helped us hiring some great writers and paying them really cool. I mean we were able to provide business to other super cool people and generate business for them. We met so many new folks and helped them to earn well from our clients. It was in April 2018, when we raised our business funds to 13000 USD. That was really a BIG BIG moment for us. We never thought that we would come that long in no time after all those bad memories. Today the LinkOceans is officially launched with all the required services in its HUB for all the startups, businesses and owners. We are still grounded and take every single client on priority. The journey has been beautiful, amazing and quite learning so far. From $30 to $10000 USD, from 1 client to 500+ clients, from ZERO investment to 600-1000 USD investment, mean something to us. And we oath to deliver you guys the best from all our sincerity and efforts. We would be sharing some more awesome stuff in coming days. Like case studies, marketing tips, SEO and other profitable stuff that could help you to do your branding in the right way possible. A lovely and inspiring read. Nothing comes easy and immediate.